I don't talk about pregnancy a whole lot in this space because, well - I don't love it. Maybe it's because I've been pregnant so much in such a short amount of time, or maybe it's just the controlling side of me feeling out of control, but it's hard. I miss my wine, I miss my abs, I miss seeing my toes, I miss sushi. I miss wearing cute and comfortable clothes (maternity clothes seem to come in 2 styles - cute or comfy - not both), I miss sleeping on my stomach, I miss sleeping on my back. I miss digesting food like normal non-pregnant humans do for the love of Pete. All this is terribly ungrateful as pregnancy is a beautiful miracle and all. I know I have it pretty easy from a physical standpoint. I've had friends who were hospitalized from nausea on multiple occasions during pregnancy, friends who have been on bed rest for MONTHS during their pregnancies and friends with pregnancy complications that mean they have to get weekly shots, take additional medications and go to even more check-ups than regular pregnancies require. My body seems to take pregnancy pretty much in stride and so yes, I try not to whine (except to B Daddy) about how much I dislike it. And yet, I do. Except for the part at the end where you have a sweet baby. I really like that part. One of the things that is hardest for me (and I assume for every woman) about pregnancy is how you almost entirely lose control of what your body is doing. While there are definitely things you can do to help yourself out (such as not eating an entire sleeve of Oreos in one sitting - I'm talking to you self) it seems to me that each girl's body kind of does its own thing while pregnant. Some girls barely gain any weight except in their bellies while other girls' entire bodies expand from face to feet. Some girls gain their weight in acceptable, small increments from Week 1 to Week 40 while other girls (that would be me) gain in fits and starts throughout the 9 months. Sidebar: Have we talked about my control-freak tendencies? Yes we have. I have them. I am working on them. I went for a check-up (16 weeks! I'm ONLY 16 weeks along) on Monday and the scale shows I've gained 16 pounds so far. While part of me was excited it wasn't more, I was about 5 pounds over my happy weight when I got pregnant, so when I do the mental math, that makes...21 lbs I need to lose and I am NOT EVEN HALFWAY THROUGH. Every time I go to the doctor and step on that scale I have to give myself a pep talk about how I've lost the weight before and I can do it again and this is just how my body does pregnancy. I've had that mantra on repeat for a few days now - but I know from past experience that looking at myself in the mirror from here on out will be a struggle. Watching stretch marks that had mostly faded re-appear, saying goodbye to my waistline and feeling FAT even though I know it's baby, not fat, are all things that make it feel as though each day is an uphill battle to find the self-esteem I usually have in over-supply. My weapon of choice in the battle against the bulge has always been and will likely always be working out. Give me a choice between a plate of brownies (accompanied by a 30 minute CrossFit workout) and abstinence and the brownies win every single time. I'll gladly hit the gym 4 days a week if it means I can eat what I like for the most part. 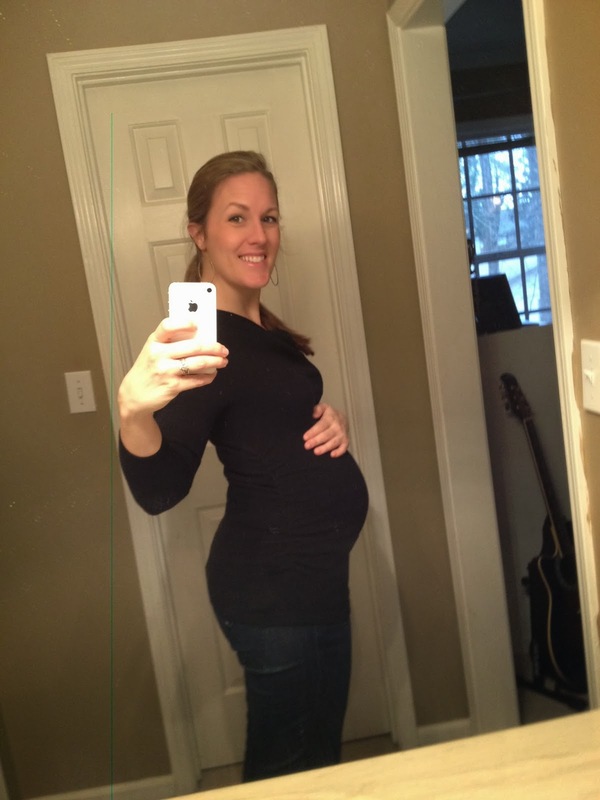 The first time I was pregnant we didn't belong to a gym and I would typically run or do yoga for exercise. After 15 weeks I stopped running completely (it hurt) and did yoga and modified pregnancy workout videos (snooze...) for the rest of my pregnancy. I gained around 35 pounds with #1 and was back to my happy weight sometime within 4 or 5 months. When you just have one baby and you stay at home...you can work out A LOT. At least I did. With #2 I had little time for regular exercise (thanks Baby #1!) and still didn't belong to a gym. I needed to spend my early mornings in prayer and meditation rather than exercising in order to survive the day. I did manage to keep up my pre-pregnancy routine of doing Jillian Michaels 30 Day Shred a few times a week for as long as I could (around 20 weeks this time.) I gained 38 lbs this time and was down below pre-preggo weight in time for a trip to the beach that summer (7 months later). When I was pregnant with Blue Eyes (#3) we belonged to the YMCA (cue angels singing) and I went with religious devotion several times a week. I remember attending Zumba class until about 35 weeks and then walking on the treadmill from that point until delivery. I know I gained very close to but definitely less than 40 lbs that time around and it was gone much sooner than the previous time thanks to the Y. This time around I've been keeping up my now usual routine of hitting the gym 3 or 4 days a week. Free childcare + all my friends go there = no brainer. Throughout the week I go to a kickboxing class, a Dance Battle Build class, a bootcamp class and a Barre class. The variety is interesting and keeps me from getting too sore. This time around I am determined not to quit exercising until my body begs me to. (Hopefully it never will.) The workouts I do now are more intense than I have ever done regularly before. Before getting pregnant I think I was physically the strongest I've ever been. Push-ups? I love them. Seriously. While I'm hoping that maintaining this routine means I have less work to do after the babe is born, it doesn't seem to be making a difference in what the scale says. When I look back over my pregnancy history, 35-40lbs seems to be what my body does, exercise or no. I had to miss Monday at the gym because of my doctor's appt and I'll miss my work-out today because of a commitment...so this week I'm dealing with some anxiety about my lack of exercise. which is just dumb - but true. All that to say...being a pregnant girl is tough. You can send chocolate to ease the pain if you like. Also, I've heard the support band is great, but I never got one myself. I exercised pretty much until delivery of my first, not at all with my second (and gained 50 pounds with each) and exercised about 2/3 of my third pregnancy and gained 40 pounds. The difference with the third was eating far better (mostly vegan). I certainly felt more energized after working out and that kept me going this last time!